We remember when Siggi Hilmarsson’s skyr (pronounced SKEER), Icelandic-style strained yogurt, first appeared on the shelves of Murray’s Cheese in Greenwich Village. Hailing from Iceland, the transplanted New Yorker found the yogurts in the U.S. too sweet and not thick enough—even the Greek-style yogurts. So in 2004 he started to make his own, in his kitchen. Today, Siggi’s skyr is available nationally, to the delight of many. This is not bargain yogurt. It’s even pricier than Greek brands—and it’s thicker than Greek yogurt as well. The reason is, more milk is required to produce the same quantity. You get what you pay for. Greek-style yogurt is thicker than American-style yogurt because more water is strained out of the whey—it’s triple strained. But skyr is drained even more. Think of it as quadruple-strained yogurt. One cup of Siggi’s skyr requires four times more milk than a typical American brand. The result is so thick that a spoon stands up straight in the cup; yet it has 0% fat (some flavors are lowfat, 2%). The concentration of milk also delivers more calcium and protein. 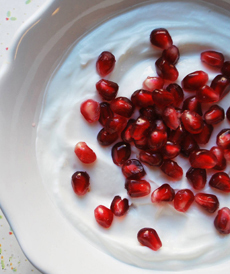 A bowl of Siggi’s skyr with pomegranate arils. Photo courtesy Siggi’s Dairy. IS SKYR YOGURT OR CHEESE? In Iceland, skyr is typically fat-free because all the cream has been removed to make butter. If you look for information on skyr, you may find it referred to as a cheese. So is it yogurt or cheese? It depends on the recipe of the individual producer. The recipe arrived in Iceland from Norway in the Middle Ages. It most likely was originally made as a cheese, with rennet. These days, some ism some isn’t. Siggi’s is yogurt. The difference between a cultured dairy product, such as sour cream or yogurt, and a fresh cheese that looks just like it, such as fromage blanc or quark, is the addition of a coagulant, such as rennet. With cottage cheese and ricotta, you can see the curds. With fromage blanc and quark (and most other cheeses), you can’t, because of the particular recipe. You also can’t tell the difference by tasting it. The textures of sour cream, yogurt, fromage blanc and quark are very similar. Don’t confuse these fresh cheeses with yogurt cheese like labneh. Regular yogurt is made by combining milk with live cultures. It is available plain and flavored, made from whole milk (5% fat), lowfat (1%) and fat-free (0%). Greek yogurt follows the same recipe, but is triple strained, removing a portion of by the whey. This creates a thicker yogurt that is higher in protein. It may or may not be tangier than regular yogurt, depending on the processes of the particular brand. Skyr, Icelandic yogurt, is even thicker than Greek yogurt. Think of it as quadruple-strained. It is made from skim milk (0%)—the cream is skimmed off to make butter. In Iceland it is often made from raw milk, which is not legal in the U.S. for fresh dairy products. The more concentrated (strained) a style of yogurt is, the costlier it will be because it contains more milk and less water. Check out our Yogurt Glossary for much more on the different types of yogurt. 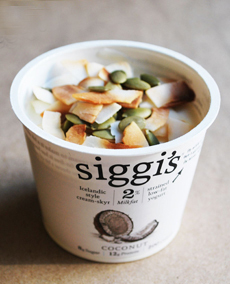 Siggi’s coconut yogurt topped with toasted coconut and pumpkin seeds from the pantry. Photo courtesy Siggi’s Dairy. In addition to its much thicker body, Siggi’s flavors have far less sugar. Mainstream flavored yogurts can have up to 25 grams of sugar per serving. Siggi’s varieties have 9-11 grams, resulting in 10-20 calories less than brands like Chobani and FAGE. While that doesn’t mean a lot for one portion, for frequent yogurt eaters it adds up. The company also makes squeezable yogurt tubes in Raspberry and Strawberry, and filmjölk—Swedish-style drinkable yogurt—in Plain, Raspberry, Strawberry and Vanilla. The brand is all natural, certified gluten-free and certified kosher by OU. Siggi’s is eco-friendly. The front of the label tells you the grams of sugar, protein and calories. The label itself is paper, and can be easily detached ffrom the plastic carton for separate recycling. For a store locator visit SiggisDairy.com. For a yogurt lover, pick up one or two containers of each flavor and tuck them into an Easter basket or a nice serving bowl.